I like using my background in history to trace the journey of my mother’s family in southern New England. I come from un-pioneer stock I guess, since Mom’s ancestors never got farther west than Connecticut. Mom’s grandparents were Baldwin, Martin, Darling and Murdock of Massachusetts and Rhode Island; Dad’s family were the MacLeans and MacLeods of Cape Breton, Nova Scotia. I am happy to get questions about research strategies and resources, as well as documentation and citation questions. I love research! There is not much I can do with a question about your specific ancestor; I cannot do the research for you. 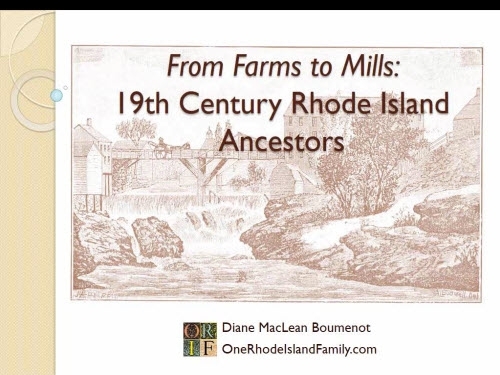 If you’re wondering how to get a little deeper into your Rhode Island research, check out my “8 Weeks to Better Rhode Island Genealogy Research” series; it may help you add something to your genealogy toolbox. 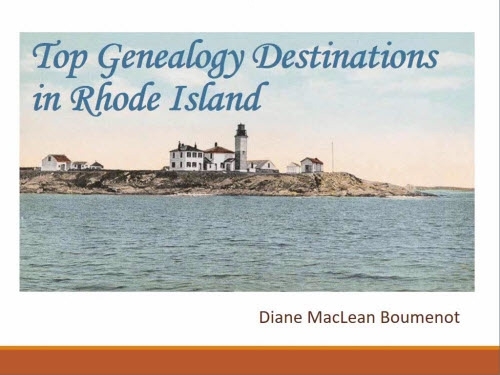 In 2018 I co-authored a guide to Rhode Island genealogy with Maureen Taylor, the National Genealogical Society’s Research in the States volume on Rhode Island, Research in Rhode Island. It can be purchased from the NGS web bookstore. I do not accept clients at this time. In fall, 2019 I plan to launch a series of online courses which will cover Rhode Island genealogy as well as some technical guidance on the organizational projects every genealogist needs to do. To be notified when these courses become available for purchase, and receive a discount coupon at that time, please email OneRhodeIslandFamily AT gmail.com mentioning “online courses” and giving your email address. When I launch the courses, I will email the announcement and the coupon code to you. Research in Rhode Island, a volume in the National Genealogical Society’s Research in the States states series, was published in 2018 by Maureen Taylor and me. It is available for sale at the NGS bookstore. I give presentations from time to time at libraries or genealogy meetings. I AM CURRENTLY BOOKING SPEAKING ENGAGEMENTS FOR AFTER SEPTEMBER, 2020; NOT BEFORE. Feel free to message me at rhodeisland202@gmail.com. For a local group or library, a fee of $100 is acceptable, but sometimes I can help out for free. I will announce the Sept. 2020-August 2021 topics at a later date. I have some presentations available on Legacy Family Tree Webinars (see images in the side column, and visit the set at the link below). That is a subscription site, and any purchase made there will benefit me in a small way. Personally, I have learned a lot from Legacy Family Tree Webinars. It’s a wonderful way to explore a new location, tool or method. Produce Your Family History Book for $20 Thurs 3:00 p.m.
Make Your Ancestors Famous: New Ways to Tell Their Stories Sat. 4:45 p.m.
Five Methods for Solving Your Rhode Island Brick Walls Wed. 6:30 p.m.
To subscribe to new posts on One Rhode Island Family by RSS feed, use the RSS – Posts link on the side column. To subscribe by email, use the “Free Subscription” box at the top of the side column. Thank you for visiting! Thank you for this! You’ve given me some great ideas about how to capture what I do on my own site. I love that you highlight your presentations and book contributions. Hi Diane, Thank you for your informative article about Howes Tavern/Red Horse/Wayside Inn. I am a descendent of Sarah Leavitt, wife of Samuel Howe who built the Inn. Thanks for the note David! Hi Beth. I should have books at the Sept 29, 2018 RI Genealogical Society meeting at the Barrington Public Library as well as the October 20, 2018 Genealogy Marketplace, 10:00 a.m. – noon, Aldrich House, 110 Benevolent Street, Providence, RI. But I believe when you follow the link to the National Genealogical bookstore site, they don’t charge shipping so it’s not hard to order from them if you can’t make either of these events. Thank you for asking! Hi Beth. Unfortunately, if they can’t find it and had no suggestions there’s nothing you can do. Rhode Island judicial records were scattered and neglected for years, so even though it’s a bit better now, some stuff is just gone. I wish I had a better idea for you. If we meet this fall, let’s chat again. Loved finding your page. I am a direct descendant of George Lampheres son Theodosius (7x gg). Your pages on Westerly RI, and the Lamphere locations are very interesting, and personally meaningful to me as they are all proven direct relatives on my tree. I’m currently researching the Hopkins RI Revolutionary War Miltia that my great grandfather Joshua served in. Would love to see any other info you find on my early family. Stumbling across your Website was a Godsend! I’m doing a Family Tree for my husband, who’s ancestors are from the Newport/Middletown/Fall River area’s. Although I have his 3X Great Grandparent’s names, I was having a hard time connecting them to their families, so I started to doubt that I had their actual first names correct. Then I read your blog on searching war pension records. Sure enough, there was copy of their Marriage Certificate in the Pension file in order for his Grandmother to prove she was entitled to apply for the pension! Thank you so much for that hint!! I’m from Texas, so I’ve learned more about Rhode Island and Massachusetts than I could ever imagine! 1. The boundary dispute over the Fall River area; 2 The 1752 Calendar discrepancy…which I never knew about. Being down south, I have done a lot of my research online. Your website is a great addition to my reference list. Any suggestions for the Newport/Middletown/Fall River area research references would be greatly appreciated. Thank you again! Thank you LeAnn. Fall River is a tricky area and it would depend on how early the family extends back in that area. Or perhaps that’s what you’re still trying to ascertain. At any rate, deeds and probate should be online for that area, if that helps. For the Rhode Island side, it’s only probate online. Check out the long spreadsheet of manuscript titles available at the Newport Historical Society – they will usually accept one well- posed question and try to help, if you find a specific manuscript where you want a lookup. They will not take general questions about your ancestors. Hi Diane, The more I learn about the Phillips families of colonial RI the more confused I get. I am trying to identify the John Phillips of Jamestown (Newport) mentioned in the 1721 marriage record of John Johnson and Sarah Phillips, “of John of Jamestown.” Could this be the same John Phillips mentioned as son-in-law in Robert Burdick’s will in 1692? Do you know of any work that may have already been done on this Phillips family? Mark, the one thing I think you can know for sure about the Rhode Island Phillips is that they are not properly sorted out anywhere. Research on them would have to start from the ground up, with early deeds and probate. I have not yet attempted any of this with my Phillips ancestor. Thanks to an OLLI genealogy class at our local university, I’ve started to unravel the family history quagmire. I am directly related to Hope and James Phillips and John Angell and Ruth Field. My great grandmother, Georgia Phillips (born in New Berlin, NY) married Charles Phillips who was born in Brothertown, Wis; although, his father Edgar was born in New York, possibly Chenago County. Both Phillips’ lines have multiple James in their lines…possibly cousins (?). My grandfathers may have descended from the oldest son, who was named after his father. Both of these Phillips lines go back to early colonial times, Rhode Island and Massachusetts. It makes me crazy, at times, trying to connect all the dots and fill in the missing pieces. I’ve had DNA collected through Ancestry, but I haven’t gotten any Phillips’ connections. Any ideas…right now I’m stuck researching James Phillips (born 1815 in Rhode Island) and his wife, Lydia Livingstone. Thank you, thank you, thank you for hosting this wonderful site! I can’t wait to investigate all you have to offer. Debi, I think there is plenty of room for progress here. The Phillips are really, really tough and there is more than one early Phillips family in Rhode Island. Lots of vitals were never recorded in the 1815 era so probably you won’t find that. Your best bet may be the Livingstones if they were Rhode islanders – that would be a more rare name here. Unless he married her in New York state, then she could be from anywhere. New York state was the usual first or second stop as the generations headed west from Rhode Island starting about 1790. Very good luck to you, keep checking out the 8 WEEKS series to tackle various types of records. Just about everything might be a possibility! Hi Diane just wanted to say how interesting your blogs are. I was searching for my Emery line and came across John Emery 1754 – 1828. my 3rd cousin 7 times removed. Got into this line thru my Smith line in Maine, Samuel Smith married Margaret Emery. Looking forward to reading more of your stories. I really don’t know how i got here but the name NewBettsTefftfamily by Jerry Betts came up on my My Herritage page. Thank you! This is very helpful, I missed that there was a state census in 1905! Perfect timing. Thank you for your wonderful, robust, R.I. site! I’m helping a non-blood cousin research her lines and have a bit of a brick wall in relation to her immigrant great-grandmother. I know that great-grandmother married in Rhode Island but before we go to the time/expense of ordering a marriage certificate, could you tell me what I’m likely to find on one from 1905? We’re keen to learn where (in Italy) this lady was from and I’m hoping the marriage certificate might help. Amber check out my Providence vital records page, I have several index volumes linked there. If found, you could send the citation to the Providence City Archives for a scan of the page. They will not charge you much. If not found, contact the Rhode Island State Archives. They will find the entry and send you a copy of the state record from microfilm; the price will be reasonable. If actual certificates were needed you would then have to pursue that directly with the town or city clerk from the correct town, and that will cost plenty. I also suggest you go to the Census portion of my 8 Weeks series to make sure you are accessing the 1905 census correctly. The census taker might have written an exact location in Italy, you never know. Good luck! Love the book links. I’ve been downloading old books through Google and Family Search for several years now and probably have somewhere around 600 on my computer that are relevant to my genealogy research. Arnold’s Vital Records is one of my favorite sets! Thanks Carolyn! I agree, it is incredibly helpful for genealogists to build their own collections of those books. Hi Diane – my friend forwarded me the link to your page. On my mother’s side, my grandparents are Weston MacLeod (granddad) and Agnes MacLean (grandmother) and I have a ton of extended family in Prince Edward Island and Cape Breton. So we are probably related somewhere! I never meet Scottish people in Rhode Island – this is very cool! 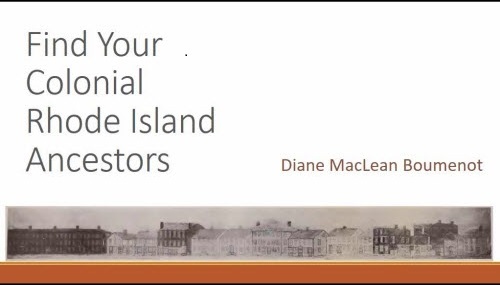 Dear Diane, I stumbled across your blog whilst trying to find out more about my ancestor Daniel McHarron who was a loyalist granted land in Chester and was a Freemason in lodge 9. I believe at one time he was the lodge master. How wonderful it was to see the document you have about your ancestor James Anderson. It not only confirmed Daniel’s membership of lodge 9 but to see his actual signature was just incredible. Daniel and his descendants were also seafarers and at one time captained their own boats. Thank you for sharing your stories and finds. Geraldine, that’s simply amazing. And good for you for having the persistence to find it! I’m wondering how you knew what lodge your ancestor was in – what scraps of information were handed down to you, or did you find? We haven’t been able to make much of this Masonic connection. I’m really thrilled to “meet” you! Where was Daniel from originally (before he fled to Nova Scotia?) Many thanks for your note! I’ve just started tracing my family history and my paternal grandmother – my paternal grandmother was a Ballou. I stumbled across your site and found it to be fascinating and very helpful. I’m in the process of verifying my facts and just started to work on my paternal grandfather’s side. Unfortunately my grandmother married a Smith so it not so easy. Just too many Smiths! Just wanted to thank you for all your hard work and the valuable info you provide. I’m a novice at this so it is really appreciated! Thanks for leaving a comment, Herta. Good luck with your research! Thank you so much for the kind words. In fact, your link has brought numerous readers to the blog over the years; it’s much appreciated. I think the blog encourages me to write one story at a time, so I always have some things written and ready if I want to put some info together in an informal book on a certain line – I do this from time to time using lulu.com. Our genealogy is never complete, is it??! and the blog helps me make incremental progress. (I apologize if this comment posts twice: technical difficulties during posting!) Anyway … I stumbled upon your site and I just had to say – OH, THE HISTORY! Having (unsuccessfully) attempted to research my husband’s side of the family, I can truly appreciate all your hard work!!!!! Hi, I stumbled upon this. Very interesting. Please note my name! I wonder if there is a connection??? Two times in my family line a Sheffield married an Arnold; one marriage in particular occurred between William E. Sheffield of Stonington, CT and Mary Arnold of Norwich, CT. They are my 4th Great Grand parents. Mary Arnold has been difficult to research. So far I have her birth c1769, CT, marriage 18 Sept 1785, Stonington, CT (yes, she was 16 years old) and death p1860, NY (she was 91). The Sheffield family were in shipping, commerce and trade. During the American Revolution the Sheffields were privateers in Stonington, New London, Connecticut and Rhode Island. Thank you for your website. I now have a few leads to follow in establishing Mary’s lineage. I was going to write a blog piece about the Boston Evening Transcript 1890’s column but decided to see if there was a posting about it already. Lucky for me you had already covered the subject with a very good posting, so I wrote a little piece about one of the questions in the Jan 1895 column. Thank you for an excellent piece. I enjoy your blog. I am just getting into researching my Rhode Island family roots – my grandfather (Howard Briggs) was from there and I am trying to figure out who his grandparents were. Also I have an ancestor, Stephen Murphy from Westerly (born about 1828) who married my maternal ancestor from Groton CT and stayed there, and I have hit a brick wall with him. Nice to hear from you, Bev. I think I have a “Murdock” tag along the side column, you can find any other material related to the Murdocks that way. My relationship to them is pretty murky, but I’m hoping to learn more, eventually. I found your site and have found it so helpful in my endeavors of my Arnold genealogy. It is my hopes that I will finds some links with your blog. Thanks again for the access links and books authors noted. Thanks Randy. No end in sight for my Arnold mysteries so I will keep adding what I can find. I wish us both luck! Thank you for the article and the site & blog. If I ever get my wife’s Inmans and Pages out of the 1720’s in Gloucester they will probably connect to the Arnolds somehow. I enjoyed your site, where I found the date of an important family wedding from the 1930s. I’m working on a fictional account loosely based on a local family history. Since its fictional, I’m not bound to exact times or places, but knowing these facts helps to place events in chronological order, thus giving my work greater authenticity. I have bookmarked this site and will definitely return. I am a music historian, but fiction writing is new to me. I’m co-editor of the book, Rhode Island’s Musical Heritage: An Exploration (Harmonie Park Press), 2008. No website yet. Robinmaya is right. This is a great model for a blog as well as a very well organized and attractive website. Thank you! Thanks! I am also descended from the Inmans, and as you say, those are all early Providence names. Thanks for reading! I hope to post more in the future as i discover more about all those folks. Hi Diane- Just wanted to tell you how much I enjoy reading your blog! It is very well done . I just wish we had some ancestors in common! I am watching your threads relating to the Tefft and Darling line to see if there is any connection. I hope some day to begin a blog of my own and I know when that day comes I will use you as a role model. Thanks for thinking out loud.